Analygas® Systems Model 21 is an economical and durable gas monitor. It has stood the test of time, having been upgraded and improved during a continuous production span of over 30 years, yet it is still as popular as ever with end users. The Model 21 protects people, produce and machinery from excessive concentrations of gases and vapours. It is particularly suited to operation in unattended locations such as machine rooms and parking garages. Analygas® Systems Model 21 is a wall mounted gas monitor for use in non-hazardous indoor locations. It has 2 alarm levels and is supplied with 1 or 2 sensors. Either or both sensors can be configured to activate the alarms. Sensors may be mounted on the unit or in a remote area. Dry contact relays are included to control ventilation fans or permit activation of other auxiliary equipment. A 4-20mA output is standard for the purpose of data logging, PLC or computer processing. 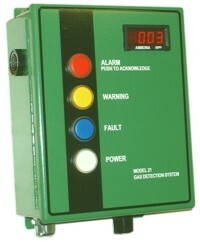 A digital display indicating gas concentration is available for mounting on the front panel or at a remote site. To reduce unnecessary fan cycling, the Model 21 is equipped with electronic timers, which delay the action of the alarms and relays. This helps prevent excessive wear on external control systems. This favourite of many years is ideal for use in machine rooms, parking garages, loading docks, battery charging areas, furnace rooms, etc.